The stars still deliver, the supporting cast (especially Collins and Mark A. Sheppard as demon Crowley) remains prized, and the writers keep coming up with witty variations on the show's Route 66-meets-The X Files premise. 989 min. The CW. Directors: Robert Singer, John Showalter, Jensen Ackles, Thomas J. Wright, Guy Bee, Tim Andrew, Charlie Carner, Paul Edwards, Nick Copus, Jeannot Szwarc, Serge Ladouceur, Phil Sgriccia, Kevin Parks, Steve Boyum, Robert Duncan McNeill. Cast: Jared Padalecki, Jensen Ackles, Misha Collins, Osric Chau, Mark A. Sheppard. Most television is "comfort food," and a hit show is liable to stay put feeding its public until it loses its taste for what was once a favorite snack. Given the economic model of not fixing what ain't broke, showrunners can be victims of their own success (or that of their predecessors), so consistency of quality in long-running series is nothing to be sneezed at, even if a show has long since exhausted what it has to say—which brings us to Supernatural and my unwillingness to treat it like a facial tissue. The eighth season of Supernatural found a show that had been there and done that producing twenty-three episodes that, taken together, are pretty much redundant to what the show calls "The Road So Far." For some time now, Sam and Dean Winchester (Jared Padalecki and Jensen Ackles) have been taking turns sacrificing their ways into other realms. Dean went to Hell at the end of Season Three, Sam went to Hell at the end of Season Five, and Dean and fallen angel Castiel (Misha Collins) became trapped in Purgatory at the end of Season Seven. Each time, the brother left behind gets angsty (sooner or later), and the brother returns to Earth not quite the same man as when he left; fraternal conflict ensues. And so there's a same-y feeling at the top of Season Eight, when Dean returns, under mysterious circumstances, and what each brother has done since the Season Seven finale threatens to drive a wedge between them. And yet, I'm not complaining—because even if Supernatural has already found occasion to "Jump the Shark" (the winking title of a Season Four episode), it has yet to resort to an actual "Clip Show" (the winking title of an Eighth Season episode). In other words, the show—created by Eric Kripke, but now run by fellow executive producer Jeremy Carver—hasn't slipped much in quality; it's doing just fine, thanks. And fans don't seem in any hurry to put the show down for a dirt nap. The stars still deliver, the supporting cast (especially Collins and Mark A. Sheppard as demon Crowley) remains prized, and the writers keep coming up with witty variations on the show's Route 66-meets-The X Files premise. Season Eight's mythology mostly concerns a scramble for a tablet (or tablets?) containing the Word of God and, therefore, game-changing power. This naturally makes prophet Kevin Tran (Osric Chau) an ongoingly valuable character, as he's the only one with the power to translate the Word. This season, we meet Mrs. Tran (Futurama's Lauren Tom), Kevin's "tiger mommy." DJ Qualls returns as Garth, who—much to Dean's chagrin—is attempting to fill the hunter-assisting void left by Bobby Singer (Jim Beaver), and Felicia Day returns as fangirl Charlie Bradbury, in the Live Action Role Play-themed episode "LARP and the Real Girl" (and returns again in "Pac-Man Fever"), and Madison McLaughlin shows up for a reprise of her teen hunter Krissy Chambers. A freshly unearthed secret society known as the Men of Letters allows the show cleverly to expand its series mythology a bit and provide the boys with a new "home base." The show also adds a few new characters who hold promise for future episodes: God's scribe Metatron (Curtis Armstrong of Moonlighting), demon Abbadon (Alaina Huffman of Smallville), and vampire Benny (Ty Olsson). Throw in an underground supernatural auction ("What's Up, Tiger Mommy? "), the Chronicle pastiche "Bitten," a cartoon-rules adventure ("Hunteri Heroici"), and a video-game dreamscape ("Pac-Man Fever"), and you get a pretty darn entertaining season of genre TV (plus: guest stars Mike Farrell and Hal Linden—both arguably underused, but hey, it's Mike Farrell and Hal Linden!). As long as Supernatural can deliver at least this well, it's welcome on my TV. 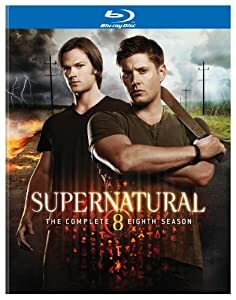 Warner's Supernatural: The Complete Eighth Season on Blu-ray lives up to and/or surpasses the A/V quality and supplemental content of the previous seven seasons. The image is, as expected, entirely clean and stable.The transfers are also well-defined and resolved in contrast, detail (happily, even shadow detail), and texture; hues are accurate, as well. Lively, lossless DTS-HD Master Audio 5.1 mixes engage the rear channels with supernatural effects, with dialogue never less than entirely clear. The latest set rounds up a satisfying collection of bonus features, starting with Disc One's "Finding Supernatural: Creating the Found Footage Episode" (25:53, HD). A companion piece to the “Bitten” episode, this featurette gets into the inspirations for (The Blair Witch Project, Chronicle) and thinking behind the story (with several of the writers and producers interviewed), as well as how the show was shot. Disc Two offers two commentaries: “Hunteri Heroici” commentary with writer Andrew Dabb and producer Todd Aronauer and “As Time Goes By” commentary with executive producers Bob Singer, Jeremy Carver, and Adam Glass, while Disc Three includes “Everybody Hates Hitler” commentary with executive producer/director Phil Sgriccia and consulting producer/writer Ben Edlund. Disc Four holds the lion's share of extras, with "For the Defense of Mankind: The Tablets Revealed" (20:13, HD), detailing the season's primary story arc and its mythological basis (with interviewees including The Hero's Journey author Phil Cousineau); "Angel Warrior: The Story of Castiel" (19:34, HD), profiling the popular angel character with the participation of the man who plays him, Misha Collins; and the Season Eight "Gag Reel" (8:55, HD). All site content © 2000-2019 Peter Canavese. Page generated at 04/25/2019 06:33:34PM.